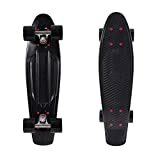 Atom brings a unique design with this drop-through longboard for ultra low riding experience. The brand endeavors the advancement of this sports and the skaters to provide the ultimate experience in the same. Get the complete view of the Drop-Through Longboard throughout this article. If you are looking for a thrilling experience of boarding, you have to make sure you get your hands on the right kind of board. You will experience a great sense of intensity combined with immense adrenaline rush and if you are the type who likes to feel the rush then this is the right kind of activity for you. 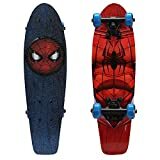 While buying longboards, you must note that the markets are filled with innumerable options as far as this equipment is concerned. 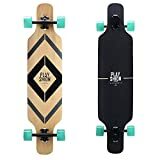 To make it easier for you, here is a review on one of the finest longboards currently available, the Atom Drop-Through Longboard (41-Inch) is a wise choice for you. Read below to know all about it. Atom is one of the leading producers of such equipment and given that they have been in the market for many years now, you can blindly trust this brand. Given that, Atom has a reputation to come up with good quality products; you can be sure of owning a good quality product and for a long time. There is enough spoken about the low lying design that this product comes in, allowing the user to experience a great sense of stability and control over their boarding experience. Besides this, another vital benefit comes in the form of wheels, they are not just of great quality but it has the ability to be composed during the turns and avoids the wheel biting as well. 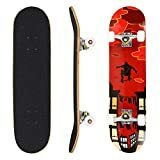 One of the most prominent feature of this product is that it offers increased stability, which is one of the prime requirements of every longboard user. Therefore, all your downhill boarding can be done with as much ease. Secondly, the design is such that it offers low riding experience, allowing you to experience the thrill in a far better fashion. Thirdly, the at times rigorous pushing around will not demean its heightened durability quality. Along with this, at every turn, you get a 9.6-inch leverage, giving you a perfect turning and eliminates wheel biting as well. 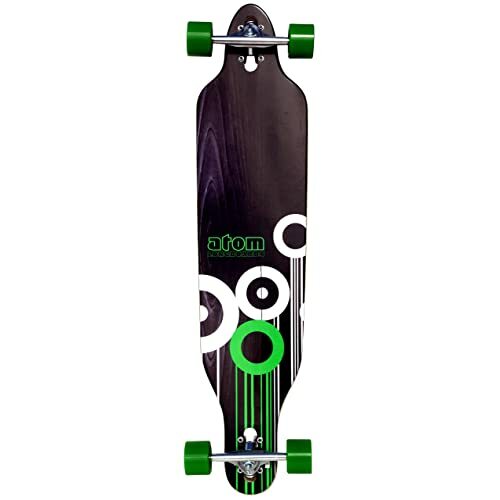 There are plenty people who simply love their longboard experience with this Atom board. Its laminate deck is one of its unique selling points because it adds on to its overall appeal. 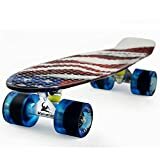 Besides this, it comes with urethane wheels, which make you boarding experience a lot, better compared to its contemporaries. Last but not the least, this product comes for a very good price. For what you pay, you get a highly durable product, ensuring you an excellent riding experience. Speaking of cons, a common concern for some people is that this longboard can display sliding problems. For beginners, this may not be such a big problem because they are still getting used to the boarding experience, but for experienced people, they do not like their boards to face sliding problems. 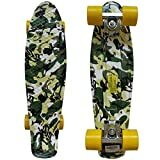 Another problem with this longboard is that its trucks start to give in with the passing time. Compared to other longboards they wear off in a mere few months, which is indeed disappointing. If you are used to longboarding, there is no rocket science in figuring out how to use this Atom’s product. In fact, it suffices the needs of both experienced as well as inexperienced users. 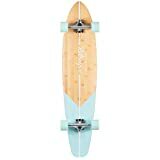 As a newbie, you do need to get yourself to know about longboards, right from setting it up to using it. Indeed, you must know what each part of the product does, so that you are out there in the open doing the right thing. When it comes to care and maintenance of longboards, you must note that its wear and tear quality will last long only when you ensure that you use it wisely, ensuring you bang it too much. Besides this, make sure you take care of the deck, i.e. to avoid too much exposure to sun and rain. A very important thing to do is keep a check on the trucks and tires, if they are wearing off, make sure you replace them. And, in order to keep them going for long, have them to rotate well so that they don’t get jammed. You must also lubricate the bearings, especially when you hear the squeaking noise. By doing so, you are adding on its durability. 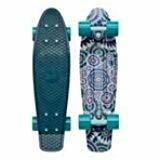 One of the commonly asked questions is if this longboard is suitable for newbie or inexperienced people. Given that this suffices the needs of all, surely it does well for all kinds of people. Secondly, many wish to enquire about the maintenance and caring aspect of the longboard. Well, if you are looking at the same query, the above-mentioned points can be of good help to you. Thirdly, a common query is about this product being suitable for downhill, the good news is that it is very much suitable for such conditions. Last but not the least, some like to know about different parts, installation process and information on how to turn or whether the board turns well or not. 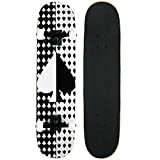 As stated above, Atom is a renowned brand offering the finest range of longboards and other products. This product from the brand is definitely a suitable option for all kinds of people. It has a blend of great design and outstanding culmination of specs and parts. Overall, this product is the right choice for you and comes at a very good price as well.